After the Dieppe raid on 19 August 1942, and as a result of the high number of casualties suffered by members of Royal Canadian Engineers during the raid, a number of devices were devised whereby explosives could be carried up to sea walls and other fortifications, placed in position and detonated from a distance. All these devices involved some type of framework on the front of a Churchill tank,1 which was used to hold the explosives. As part of their development, on 18 February 1943, a composite Troop of six Churchill tanks of the 14th Canadian Army Tank Regiment (The Calgary Regiment (Tank)),2 Canadian Armoured Corps (hereafter referred to as the Calgary Regiment), commanded by Lieutenant V.J. St. Martin, were sent to Witley, Surrey, for special training exercises in connection with anti-tank mines and methods of clearing minefields and tank obstacles. They were used in the trials of two of these experimental explosive devices, under the auspices of the Special Device Branch of the British Department of Tank Design. 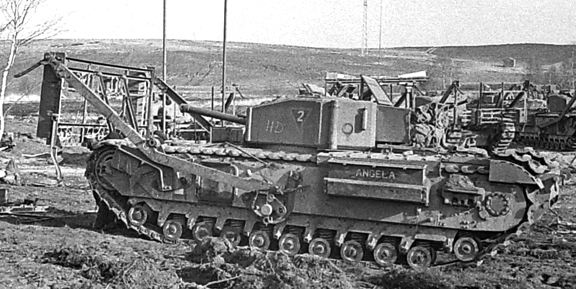 A right-side view of ANGELA, showing the right-side arm, attached to a bracket which supported the vertical “Onion” explosive device framework on the tank’s front. Note also, the two outward facing legs, attached to either corner of the top of the framework. Source: authors’ collection. 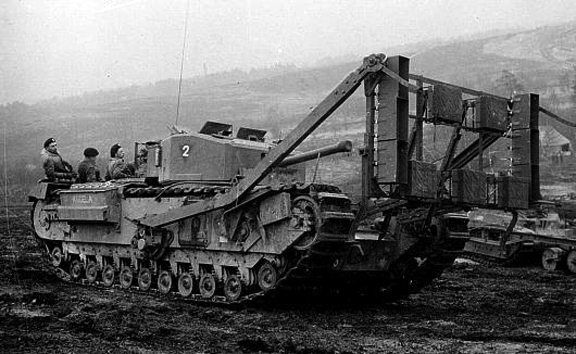 The “Onion” was an explosive device designed to allow a Churchill tank to move explosive charges into place to breach or demolish obstacles. 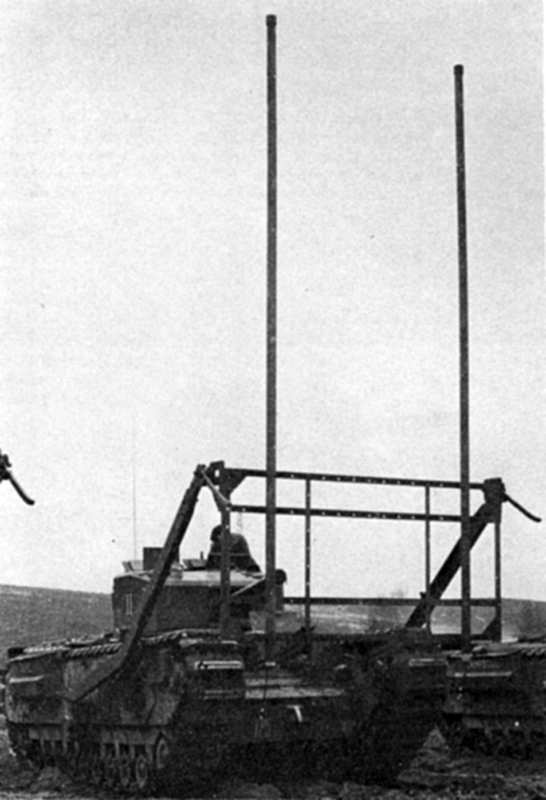 Arms attached to brackets on the sides of the tank supported a vertical framework with a pair of hinged legs at the bottom and two fixed outward-facing legs at the top. Six oblong 30-pound (14-kilograms) high explosive (HE) charges were attached, three to a side, to the outer face of the framework in boxes, or in a pattern on the outer face of the frame work, to suit the intended target. 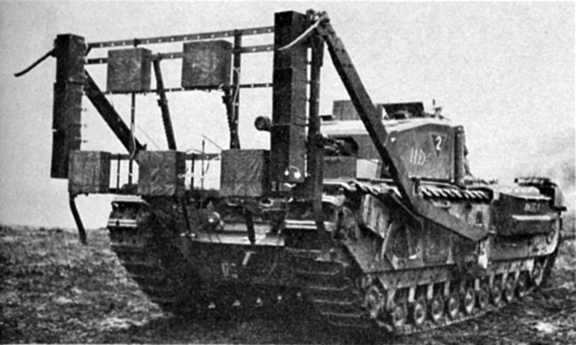 The frame was then driven into place and released, with the two hinged legs on the bottom of the frame meeting the ground first, forcing the frame to fall forward against the obstacle, while the tank reversed away, approximately 100-feet (30-metres), and trailing an electric ignition cable. Once the tank had reversed away a safe distance, the charges arranged on the framework were detonated. The frame could also be hung from obstacles, such as walls or bunkers, by using the two outward facing legs on either corner of the top of the framework. The “Onion” worked well against obstacles such as “Dragon’s Teeth” (concrete tank traps) and steel beach obstacles, but was not always effective against walls or bunkers, because the frame did not always position itself correctly after being released, reducing the impact of the explosion. The “Onion” was deemed a failure and never entered production. Bangalore Torpedoes” device, which is fitted to another Calgary Regiment tank. Source: MilArt photo archive. Front view of a Churchill Mark IV tank, of The Calgary Regiment, at Whitley, Surrey, fitted with the “Onion” explosive device. In this case, the high explosive charges in boxes are attached three along the top and three along the bottom of the outer face of the framework. Note also, the two outward facing legs, attached to either corner of the top of the framework, which would enable the device to be hung from an obstacle such as a wall or bunker. Source: MilArt photo archive. 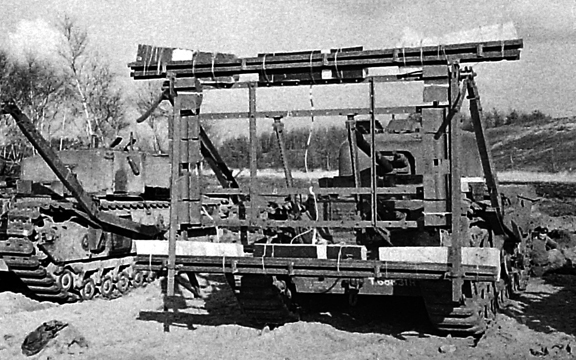 Another project that involved the Calgary Regiment’s six tanks at Witley, was the trials carried out on a second explosive device based on the Onion framework. Two lengths of Bangalore Torpedo3 were fitted upright to the face of the “Onion” vertical framework. This was then dropped into light obstacles, such as barbed wire entanglements, which when detonated was supposed to clear a path through the obstacle. This explosive device was simply known as the “Churchill with Bangalore Torpedoes,” but as a result of poor performance during the trials, it was also considered a failure and never entered production. Three (of six) Churchill tanks of The Calgary Regiment, at Whitley, Surrey. The “Churchill with Bangalore Torpedoes” is fitted to the furthest tank, while in the centre, a Churchill Mark IV tank, is fitted with the “Onion” explosive device. On the nearest tank, a Churchill Mark III tank, of No. 11 Troop, “C” Squadron, is the framework of the “Onion” explosive device, to which no explosives have been fitted. Note the outward-facing leg in the centre on the right side of the photo, which would be attached to the top right-hand corner of an “Onion” explosive device framework that is fitted to a tank that is not in the photo. Source: MilArt photo archive. The British designed and built Infantry Tank, Mark IV, Churchill (A22). The 14th Canadian Army Tank Regiment (The Calgary Regiment (Tank)), along with the 11th Canadian Army Tank Regiment (The Ontario Regiment (Tank)), and the 12th Canadian Army Tank Regiment (The Three Rivers Regiment (Tank)), were the three ‘army tank regiments’ of the 1st Canadian Army Tank Brigade, all of which were equipped with the Churchill ‘infantry’ tank. A Bangalore Torpedo is made up of one or more connected metal tubes filled with explosives and equipped with a firing mechanism, especially for destroying barbed-wire entanglements, mine fields, etc., and consisted of 3-inch (8-centimetres) diameter pipe, issued in 20-foot lengths (6-metre). Fletcher, David, The Universal Tank, British Armour in the Second World War, Part 2, Her Majesty’s Stationary Office, London, England, 1993. 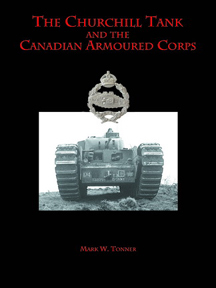 Tonner, Mark W., The Churchill Tank and The Canadian Armoured Corps, Service Publications, Ottawa, Ontario, 2011.